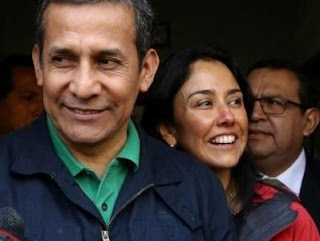 Former President of Peru Ollanta Humala and his wife, Nadine Heredia, left the prison Monday after spending 9 months in preventive detention. Surrounded by dozens of supporters and amid large security measures, Humala left the prison of the Directorate of Special Operations of the Police (Diroes) while Heredia left the women's prison in the district of Chorrillos. On April 26, the Constitutional Court of Peru upheld the ruling in favor of habeas corpus in the case of the couple and ordered that they be released. The processes against them continue. When he arrived at his residence, Humala went out to talk to the press with his wife. In those statements he thanked the support of his followers and said that both came strengthened from the experience. He also indicated that they will "demonstrate the injustice that has been committed" with his family. Humala, president between 2011 and 2016, and his wife are being prosecuted in a corruption case involving the Brazilian construction company Odebrecht. Humala and his wife are suspected of having received irregular contributions from the Brazilian company in the electoral campaign of 2011 and the government of Venezuela in 2006. Both were in preventive detention until the Constitutional Court ruled last week to revoke the preventive detention. According to the decision of the TC, the measure was excessive to face the investigation of the prosecution. The couple will face the rest of the process with the restrictive measures they had before July 2017, that is, they will have to undergo a biometric control every 30 days before a judge, maintain the same address and request authorization in case of travel. "They do not intend to accelerate or delay the investigation," said one of the couple's lawyers, Wilfredo Pedraza, who assured a radio station that his clients will remain in Peru. The prosecution also investigates other Peruvian politicians for similar cases in which they received money illegally. According to the investigations of the Public Ministry, Alejandro Toledo has received 20 million dollars from Odebrecht in bribes and is a fugitive from Peruvian justice. According to the testimonies of senior officials and the former executive president of the Brazilian transnational, Marcelo Odebrecht, they made contributions to the presidential campaigns of Alan García and Keiko Fujimori, and to the campaign to avoid the dismissal of the former mayor of Lima, Susana Villarán, in 2013. Likewise, former President Pedro Pablo Kuczynski is also investigated for having provided consulting services to Odebrecht while he was Minister of the Government of Toledo. Although the Prosecutor's Office has obtained similar evidence for almost all of these cases, the only ones for whom justice ordered preventive detention were Humala and Heredia, whose party no longer has a presence in Congress. The Peruvian Nationalist Party withdrew its presidential candidate in 2016 because it ran the risk of not passing the electoral fence and losing the registration.